In March 1918, the US government needed shipping space to get troops to Europe. To acquire enough ships, Dutch vessels in American ports were seized. The US government claimed the seizure was legitimate while the Dutch government argued the opposite. American and Dutch newspapers followed the events and expressed their opinions. Newspapers were the only source of information for people during the First World War and influenced public opinion, but they were also influenced by public opinion. 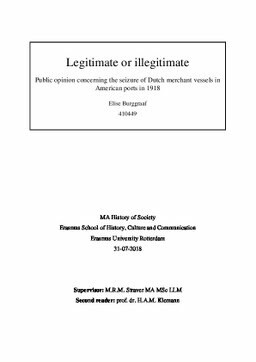 An analysis of two American and two Dutch newspapers’ way of reporting on the seizure explains which factors caused the newspapers to agree or disagree with their respective governments.